Date: Wednesday, 28th November 1973. Competition: UEFA Cup, Third Round, First Leg. 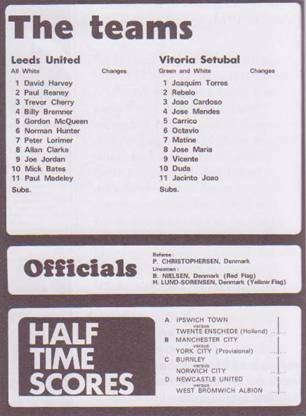 Score: Leeds United 1 Vitoria Setubal 0. Scorers: Leeds United: Cherry. Vitoria Setubal: Nil. 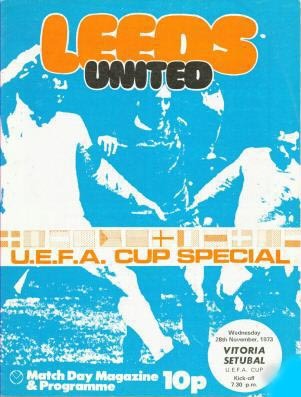 Leeds United: Harvey; Reaney (Davey), Cherry; Bremner, McQueen, Hunter; Lorimer, Clarke, Jordan, Bates, Yorath (F. Gray). Vitoria Setubal: Joaquim Torres; Rebelo, Cardoso; Mendes, Carrico, Octavio; Maria, Matini, Campora, Duda (Jose Torres), Jao. 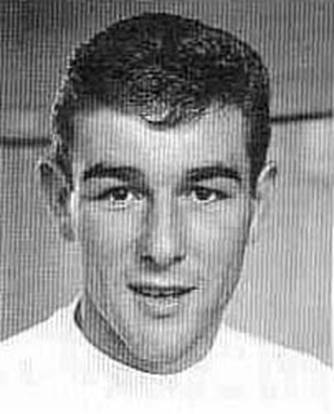 With Don Revie serving a one-match ban imposed by UEFA for anomalies in the fixture at Easter Road, Les Cocker took temporary control of the team and had a frustrating night as Portuguese League leaders Vitoria Setubal prevented United from building up a healthy First Leg lead. Apart from the quality opposition, United also had to contend with the energy crisis prompted by rising oil prices and industrial action which was to lead to a three day week. Power restrictions were imposed by the Government and so United called in a ten ton generator to power the floodlights separate from the National Grid. Don Revie watched on from the stands with United’s lowest European home attendance as United were unable to overpower a well-drilled side which had nine successive years of European football under its belt. 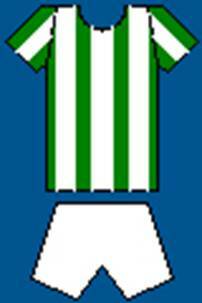 United had met Vitoria Setubal in the UEFA Cup in the 1970-71 season and the Portuguese side felt that United were lucky to survive 3-2 on aggregate. They were out for revenge and United only just shaded the home leg 1-0 with a goal from Trevor Cherry with just twenty minutes to go. It was a bitterly cold December night and the low crowd of barely 14,000 seemed to indicate that their priorities lay elsewhere as did Don Revie’s team selection for the second leg. 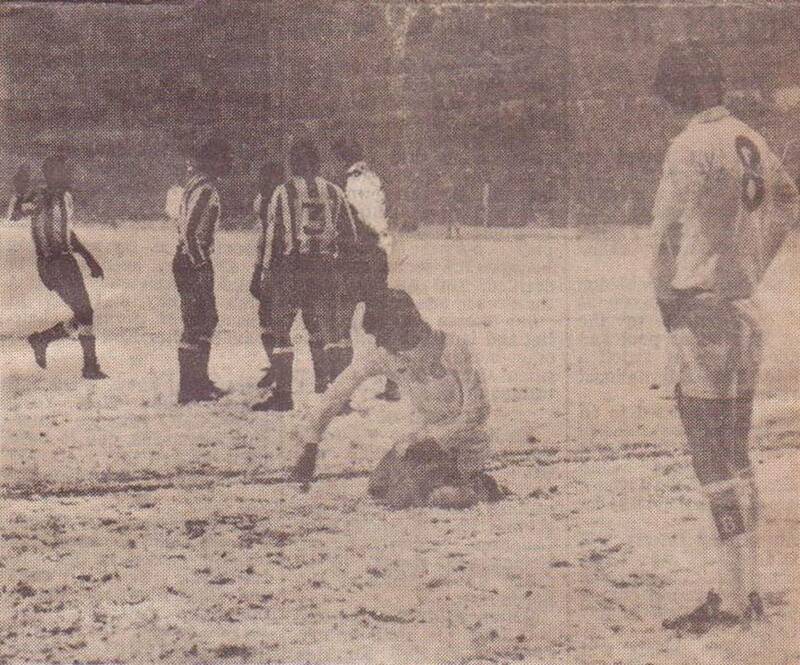 The game, played on a snow covered surface, was not without incident, but United missed a great chance to settle the tie at Elland Road. Setubal goalkeeper Joaquim Torres was outstanding, and the pick of his saves denied Peter Lorimer from twenty-five yards. The match then swung United’s way in the thirty-ninth minute when Henrique Campora felled Terry Yorath and after consulting one of his fellow Danish linesmen, referee Preben Christophersen sent off the Uruguayan midfielder. With a man advantage and over half the game to go United looked in control but they were continually frustrated by a well-drilled Setubal defence. 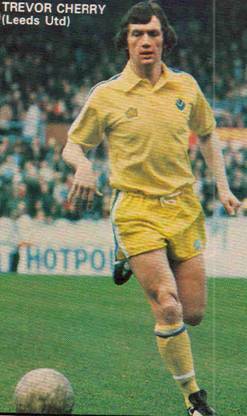 With just over an hour gone, Les Cocker sent on young Frank Gray for Terry Yorath, to add some creativity and he was rewarded within seven minutes, Gray crossing for Trevor Cherry to rifle home a left-footer for his first goal of the season. Three minutes later Peter Lorimer was brought down by Jose Mendes, and despite Setubal’s protests, the referee pointed to the penalty spot. Lorimer got up and took the penalty, but he underhit it, Joaquim Torres was able to parry it and be quick enough to charge down Lorimer’s follow up. It was a priceless save and United were to suffer the consequences.